When I first shot my glock 35, I had the glock bulge. Not good, so I replaced the barrel with a KKM barrel. Redfield makes a push through die, but in the long run a replacement barrel is the answer. It also shoots GREAT!. Thanks for the feedback and information. I save my own brass, which is run through a custom Para P16. However, there are the few range sweepings that get caught up in my policing, and at USPSA the range magnets grab everything they see. 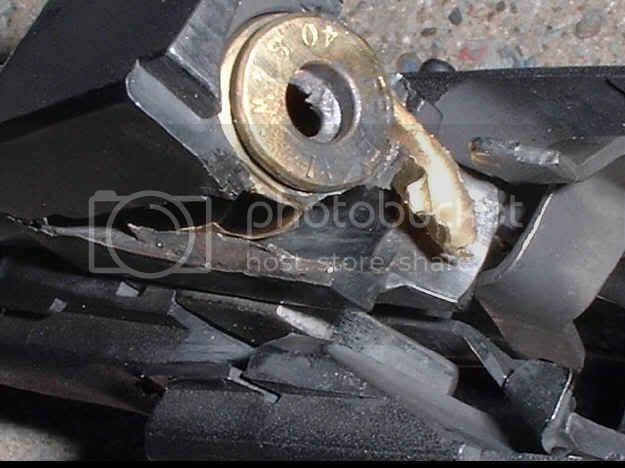 Given the number of Glocks in .40 S&W out there I believe the cost of the Redding die and the time to run the cases through is cheap insurance against a jam. I now return to my task of cleaning and packaging in prep for reloading. Three calibers complete, and five to go. This does not include the minor calibers that will wait, or hulls I have neglected over the past two years. I believe that I have posted this reply previously. I had the problem with a Gen 3 model 35 glock. I fixed the problem with a replacement kkm BARREL. But I only reload MY brass. I identify MY brass with a felt marker. Then I can easily identify my brass when I pick it up. I do use a Wilson pistol max gauge to check the loaded rounds. I use the Lee crimper die as the final step in the reloading process before using the Wilson gauge. I am on third reloads with Federal 40 S&W brass out of a gen 4 Glock 23. No problems so far but I am not loading max loads either. C45, as long as you are shooting them out of the same pistol time after time it shouldn't be a problem. You might if you switch pistols. Once I put my brass thru the push thru die I have no problems! They actually size easier. Hope I'm not too late to add my thoughts on the subject. The early Glocks in 40 S&W had a relieved feed ramp that left a small portion of the brass unsupported. 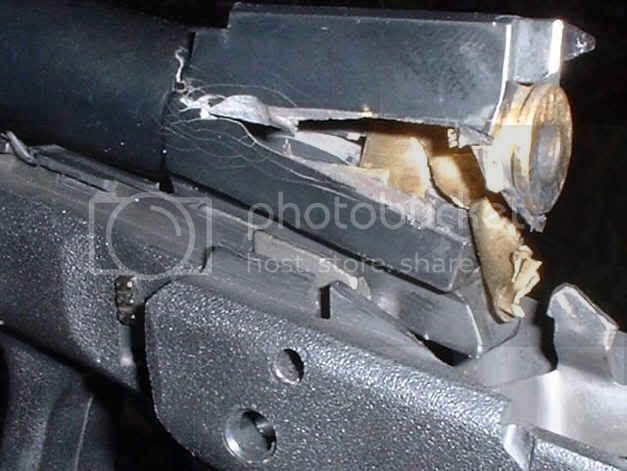 This is a common practice in Colt 1911s shooting 45 ACP ammunition. Unfortunately, the 40 S&W is a 40,000 PSI round, not a low pressure 45. There was a time when there were several blow ups using factory ammunition. This sparked a huge rise in custom replacement barrels for these Glocks. Naturally, Glock fixed the problem right away, but it was too late to save the 40 S&W reputation in future Glocks. Here are a couple of pictures to show what Iâ€™m talking about. Notice where the case failed. Here is a better view showing where the case failed. Another view of the relieved feed ramp. Note that these are very old pictures. 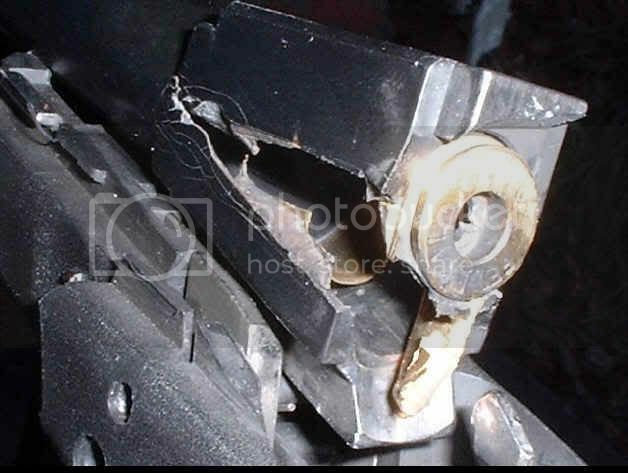 40 S&W Glocks no longer have this problem. As far as reloading goes, my 40 S&W is a SIG 229. There has never had a problem with it. I simply reload the brass that Iâ€™ve fired in it. The vast majority of my reloads are into virgin brass or brass that has been fired in the 229. The few times that Iâ€™ve acquired range brass, I have closely inspected it and run it through a Sinclair die to resize the base. This only needs to be done the first time. Naturally, you should discard any brass of any cartridge if has a prominent bulge, but careful inspection and paying close attention to details should provide safe reloads for the 40 S&W. The only pistol caliber capable of utilizing a "push through" die is the .40 S&W. This is because it is a straight walled, rimless case. The 9 MM and .45 ACP have a taper, so they cannot use a "push through" die. That kaboom pictured was a gross overload. It would not have mattered if the barrel had a supported chamber or not. You can tell because you could park a minivan in the primer pocket. And the flash hole is blown out as well. He was undoubtedly drinking early after that. A recent study has shown 1 out of 3 liberals are as stupid as the other 2﻿.